Robert B. Beaudreau, Aviation Chief Machinist Mate, born Dec. 3, 1919, St. Cloud, MN, attended two years of college and entered the USN Sept. 10, 1940. Military stations include the USS West Virginia, USS Tennessee, Ford Island NAS, Jacksonville NAS, Barbers Point NAS, Corpus Christi NAS, VP squadrons and Hickam Field. Memorable experiences include serving on the USS West Virginia during the Pearl Harbor attack; playing baseball on the USS West Virginia, and recruiting duty for the USN for three years in his home town of St. Cloud, MN. Beaudreau was discharged on Dec. 21, 1959. Divorced, he has one child and three grandchildren. He is a professional baseball umpire and a letter carrier for the US Postal Service. Hobbies include baseball, football, basketball, softball official in high school, college and professionals for 38 years. He retired from the USN and the US Postal Service and lives in Jacksonville Beach, FL. 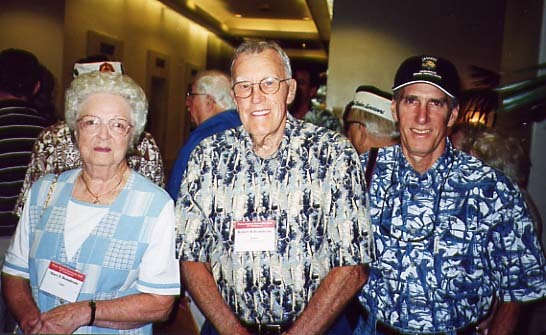 Photo of Robert, his wife Mary and son Rob in Hawaii at the 60th Anniversary of Pearl Harbor in December 2001.